A limited number of program scholarships are available for families who meet the USDA income guidelines for free or reduced lunch, thanks to the Key Peninsula Parks & Recreation Foundation. Be sure to fill out the scholarship form and send it in with your registration form and supporting income documents if you are requesting a scholarship. There are further details on the form. Camps are done for the summer 2015 season! We plan to add more camps for summer 2016. Due to the popularity of the Woodland Fairy and Carnival camps, we will again be offering those in 2016! If you have any unique ideas for camps you'd like to tell us about, feel free to send us an email to answers@keypenparks.com! We love hearing from you! Woodland Fairy Camp, 9 am to noon, Wednesday through Friday. For ages mature 3-year-olds to 12. Cost is $70. 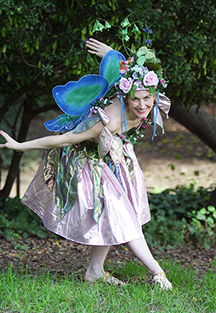 Arts, crafts and other fun to satisfy your very fairy side! Decorate your very own wings, look for special things in the enchanted forest, go home on Friday with a magical face painting! Hosted by Jacqueline Brulotte of Colorful Events. Carnival Camp, 9 am to noon, Wednesday through Friday. For ages mature 4 year-olds to 16 years. Cost is $70. Learn some carnival entertaining moves: juggling, magic, balloon twisting and more with Jacqueline Brulotte! Credit card payments must be completed by you via the online payment portal at the link below. You will still need to complete and turn in to the Key Pen Parks office registration forms for all camp participants. Credit card payments have an automatic two percent (2%) processing fee applied to the total. Refunds are allowed, minus a $5 refund fee and the original processing fee.